PSX Mega Man X5 (USA) in 16:58.68 by Atma. This game is the first Mega Man game to allow choosing, each stage, one of two playable characters, X or Zero. However Zero is judged as the greater of the two, so X is left behind gathering dust. 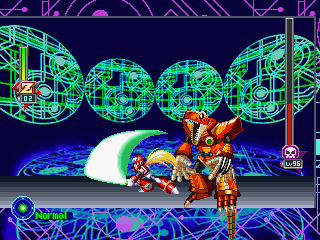 The abusable sword physics points to Zero's superiority, especially when the sword is used while standing on the ground. Bosses fall very quickly, even when they have 127 health. The downside to Zero's sword is the delay when the sword hits in the air, which explains why only 14 non-bosses were killed, as many as bosses.